Opinion: Produce grown on small organic farms remains more expensive than its supermarket counterparts. Rebecca Tucker’s thesis is as important and interesting as it is complicated and controversial. 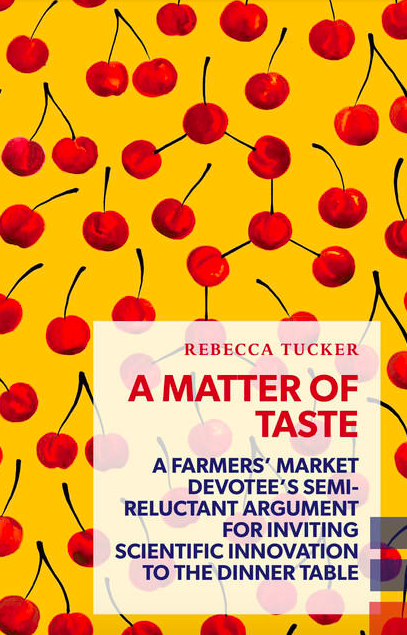 That the title of Rebecca Tucker’s A Matter of Taste: A Farmer’s Market Devotee’s Semi-Reluctant Argument for Inviting Scientific Innovation to the Dinner Table is almost as long as the work itself is telling. The book centers on a nuanced idea, but that idea is done a disservice by the briefness of the volume. There are plenty of provocative statements, but not quite enough room to flesh out a convincing argument for them. This is particularly frustrating, because Tucker’s thesis—that the sustainable food movement needs to get comfortable with technology invented after the 1920’s if it’s going to feed the world—is as important and interesting as it is complicated and controversial. For many who’ve been turned off by the puritanism of the food movement and its focus on ethics over economics, this book provides a welcome dose of real-talk rooted in practical and empathetic thinking. “If a food system is not accessible, how can it possibly be sustainable?” Tucker asks in an early section. Despite the best efforts of activists and advocates, she points out, produce grown on small organic farms remains more expensive than its supermarket counterparts. Tucker argues that this is in part because we’ve become so obsessed with an ideal of the traditional family farm—pastoral, wholesome, good—that we now automatically reject anything remotely science-y in the food system as unnatural and bad, handicapping ourselves in the fight to feed the planet with something other than corn derivatives. She has a point: the study most often cited by anti-GMO activists claiming that genetically modified produce could cause cancer in humans was retracted in 2013, and since then, there has been no compelling scientific evidence that GMOs have a negative effect on human health. Nevertheless, stigma against the term prevents farmers and scientists from working together on breeding plants that could solve pressing humanitarian problems—Tucker gives the example of a banana plant that, with the addition of a sweet pepper gene, resists the wilt that plagues banana plants in Uganda. It could be an exciting development for combatting hunger in the region, but ultimately, “There is so much fear-mongering… that that it’s near impossible to get this research out of the lab and into the world,” Tucker writes. It’s a tantalizing glimpse at what might be, and a frustrating reminder that, even in our supposedly rational world, optics still matter as much as—if not more than—science. While her points are well taken, she fails to reckon with some of farmers’ objections to the corporatization of their work, which can hinge on intellectual property, ownership and capitalism itself than anti-scientific bias. For instance, Tucker writes about so-called precision farming, which uses GPS analysis, specialized software, and smart-tech enabled machines to collect and analyze data that will help small- and mid-scale farmers make micro-adjustments to their fields, increasing their yields without increasing their inputs (think fertilizer and pesticides). In the Netherlands, she reports, a host of technological advancements including precision farming have allowed the country to increase their agricultural output while reducing their farming sector’s water consumption by 90%. Tucker acknowledges that farmers might have legitimate concerns about the security of the data harvested by these technologies, but by and large, she dismisses those who reject precision farming’s possibilities as “purists:” people who see smart and automatically think bad. They aren’t necessarily anti-science or progress: What they may be is wary of handing private corporations increased control of something—the ability to feed ourselves—they see as a common human birthright. Farmers who decide to invest in precision farming machines made by Monsanto or Deere are committing themselves to an ongoing partnership with the company in which they are asked to continually invest something—in this case, capital and data both—into a system they will never own. By buying into this model, they cede control of their farms and our food to a corporation whose ultimate goal is profit, not nourishment. Do these objections outweigh the imperative to figure out how to feed those who are hungry? It’s an interesting question; it would be interesting to see Tucker wrestle with it, but, unfortunately, that’s not in A Matter of Taste’s purview. The book was written as part of Coach House Books’ “Exploded Views” series, which publishes work “longer than a typical magazine article but shorter than a full-length book,” landing it in a no-man’s-land: long enough to be nuanced, but too short to be fully fleshed out (at 127 pages.) It’s a fascinating look at some up-and-coming technologies, but not a comprehensive argument for them— interesting if you go into it on Tucker’s team, but not likely to convince you if you don’t already agree with her views.